If husks have not been removed from corn, remove and discard. Use a vegetable brush to remove silks; rinse. Holding the ear at an angle, use a sharp knife to cut down across the tips of the kernels at two-thirds depth; do not scrape. Measure 1 cup fresh sweet corn kernels. Grease a 9x9x2-inch square or 9x1-1/2-inch round baking pan; set aside. In a medium bowl, stir together flour, cornmeal, brown sugar, cumin, baking powder, and salt; set aside. In a small bowl, whisk together the buttermilk, eggs, butter and corn oil. Add buttermilk mixture all at once to cornmeal mixture. Stir just until moistened (batter should be slightly lumpy). Stir in corn and cheese. Pour batter into prepared pan. Bake in a 400 degree f oven 20 to 25 minutes or until edges are golden brown and a wooden toothpick inserted near the center comes out clean. Cool slightly; serve warm. Makes 9 servings. Corn-on-Corn Muffins: Prepare as directed above. Spoon batter into 12 greased 2-1/2-inch muffin cups, filling cups two-thirds full. Bake in a 400 degree F oven about 15 minutes or until edges are golden brown. Makes 16 muffins. 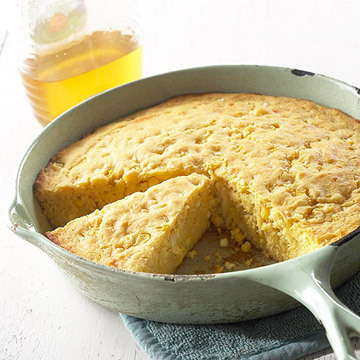 Skillet Corn-on-Corn Bread: Prepare as directed above, except place a 9- or 10-inch cast iron skillet in hot oven with 1 tablespoon butter for 5 minutes; swirl pan to coat with butter. Continue as above, working quickly so batter goes into hot skillet. Bake in a 400 degree F oven for 20 to 25 minutes or until edges are golden brown and a wooden toothpick inserted near the center comes out clean. Cool slightly; serve warm. Makes 12 wedges. * To make 1 cup sour milk, place 1 tablespoon lemon juice or vinegar in a glass measure cup. Add enough milk to make 1 cup total liquid; stir. Let the mixture stand for 5 minutes before using it in the recipe.